Raoul Wallenberg Institute of Ethics is pleased to invite all civic, interfaith, intercultural, environmental, social justice and educational organizations to join in the first planning meeting of the Compassion Games: Survival of the Kindest on Sunday, July 28th at 4:15pm at the Yahoo Center Community Room 2500 Broadway in Santa Monica, CA. 90404. The cross streets are Cloverfield and Colorado. Please RSVP to Sande Hart at sandehart at gmail. 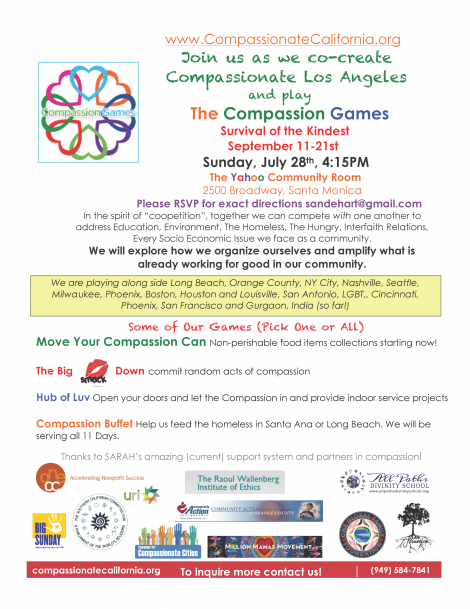 Here's a bit to of history--the first year of the Compassion Games saw two contenders: Seattle, WA and Louisville, KY. The 2013 Compassion Games have expanded to include New York, NY; Orange County, CA; Milwaukee, WI; Cincinnati, OH; Nashville, TN; Houston, TX; Phoenix, AZ; West Hollywood CA LGBTQ, and Gurgaon, India. Other cities are signing on by the day. We'd like to invite you and your civic organization to take part! Compassion Games: Survival of the Kindest will be held during the 11 days of Global Unity Sept 11th-21st 2013. The Raoul Wallenberg Institute of Ethics will be one of the regional hosts. By participating, players are called upon to perform acts of service and kindness in our neighborhoods, on the job, in service-providing agencies, and wherever their daily journey takes them. The acts of service are organized projects or simple acts of kindness to aid a neighbor in need. Building communities of conscience together. We will be working closely with California Ringmaster Sande Hart of S.A.R.A.H who will be leading the team in Orange County: http://sarah4hope.org/SARAH4Hope/Home.html. The Roerich Banner of Peace will fly during the Compassion Games marked by a special ceremony to recognize the United Nations International Day of Peace on September 21, 2013. The Compassion Games are designed to make our communities safer, kinder, more just, and better places in which to live.